September 5, 1862. After defeating the Union army at the Second Battle of Bull Run, Robert E. Lee took advantage of the opportunity, and on September 5, crossed the Potomac River into the Union state of Maryland. He hoped that his successes would result in England formally recognizing the Confederacy. 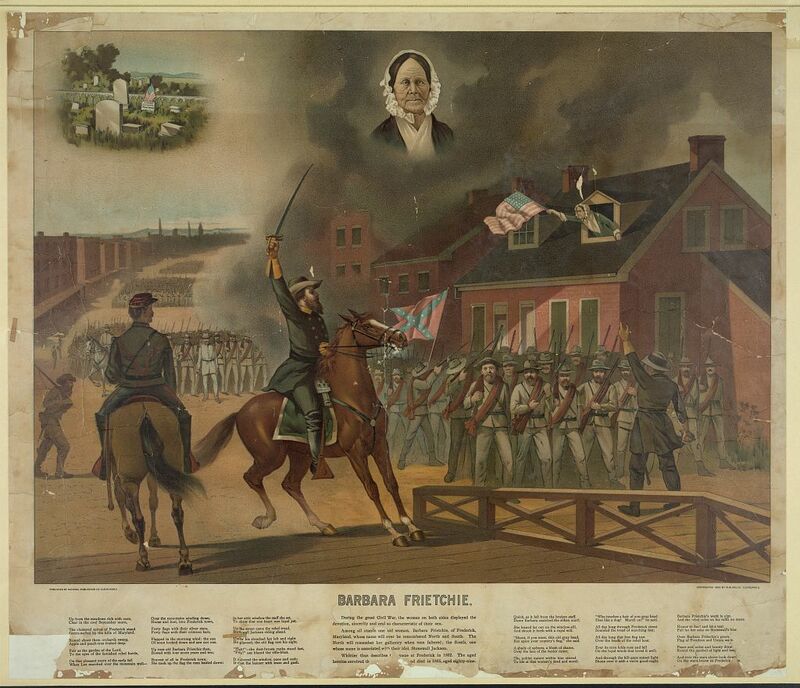 An event in Maryland involving the Confederate army gave rise to John Greenleaf Whittier’s poem “Barbara Frietchie,” which recounts one of the most famous incidents that never happened in the Civil War. Legend and the poem have it that Stonewall Jackson faced off against the elderly Barbara Frietchie for the way she was proudly waving the Stars and Stripes during Lee’s incursion into Maryland, which culminated in the Battle of Antietam. In fact, the incident involved a Confederate officer whose name is not known and a Mrs. Mary Quantrill, a Unionist. Mrs. Quantrill and her young daughter waved the Stars and Stripes defiantly as Confederate troops marched through Frederick, Maryland on September 6, 1862. Impressed by their bravery, the Confederate officer saluted Quantrill, adding, “To you, madam, not your flag.” Because the elderly Frietchie was famous locally for having once met George Washington, the story attached itself to her, and she did nothing to disabuse people of the connection. The poem become one of the best known, and most loved, of the war. ‘Halt!’ – the dust-brown ranks stood fast. ‘Fire!’ – out blazed the rifle-blast. Dies like a dog! March on! he said.